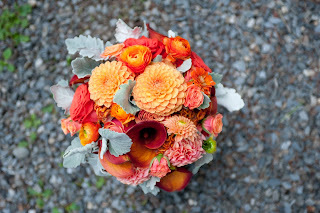 Maine Seasons Events Lake Wedding featured on Style Me Pretty's Little Black Book Blog! 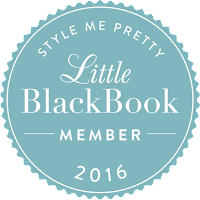 We are excited that one of Maine Seasons Events clients' weddings was featured today on Style Me Pretty's Little Black Book Blog! It is quite possible that Mary and Ian are one of the most beautiful and sweetest couples I have had the honor to work with, really. Mary & Ian are based in Boston, and reached out to Maine Seasons Events to design and plan their labor day weekend wedding celebration. 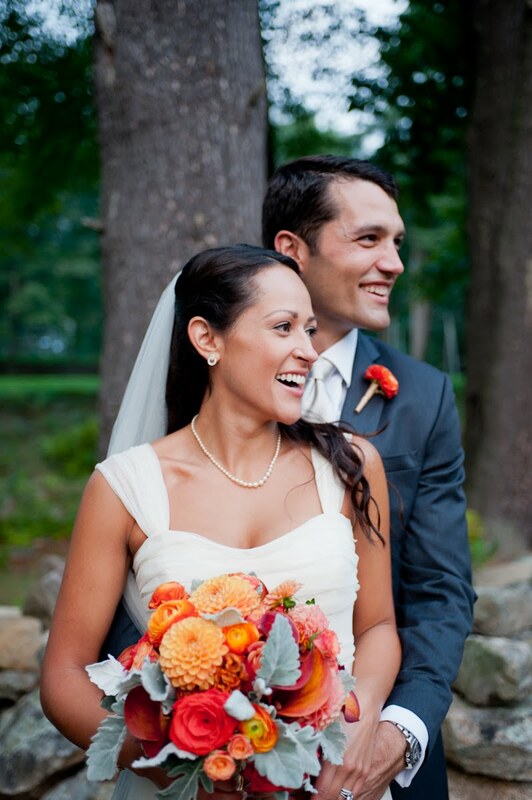 Sharyn Peavey photographed the wedding day portion of the event, and captured some fun moments! The four days of festivities took place at Ian’s childhood friend’s camp on Echo Lake in Maine. The guests spent the weekend on camp property in the camp cabins and enjoyed water and land sports, cookouts, grilled cheese bars, and a hardy brunch each day provided by the camp chef. The design incorporated the rustic feel of the lake side camp while exuding sophistication with a touch of glamour. 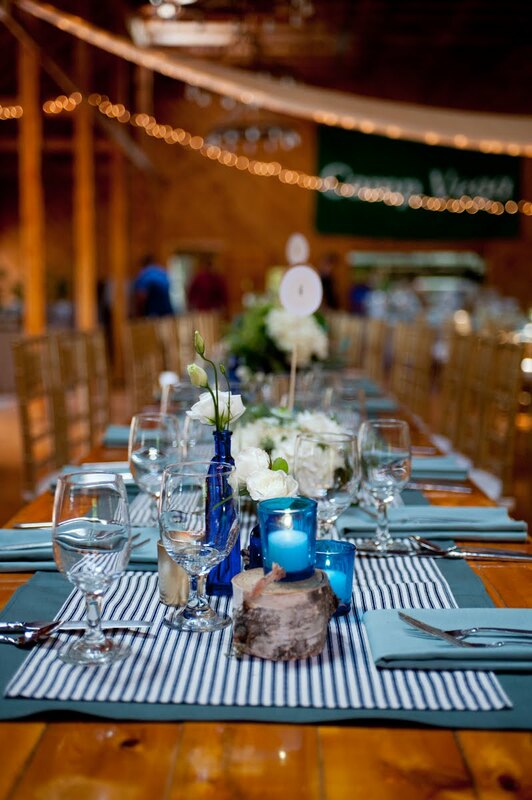 We chose custom black ticking table runners to echo the color of the loons’ plumage who frequent the lake. 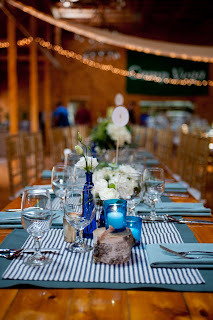 Base table runners in grey -spruce green cotton highlighted the camps natural cedar tables. 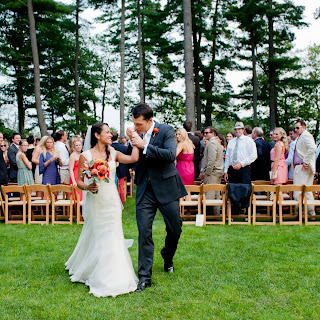 Gold Chivari ballroom chairs were added as an unexpected touch of sparkle in the room to balance all the natural wood. 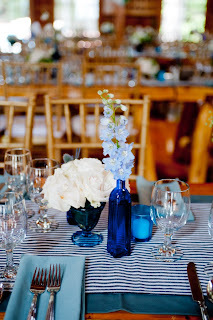 Vintage blue glass vessels and miniature tree stumps mixed with vintage gold edge glass provided containers for luscious flowers by Flora Fauna in a palette of grey, green, ivory, and blue. 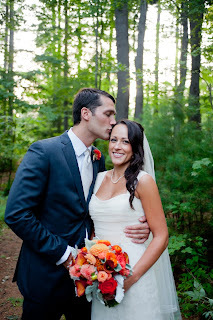 Mary and Ian’s ceremony took place in a field on the edge of the lake surrounded by tall pine trees and family and friends. Ava and I had fun collecting all of the blue glass over the winter! 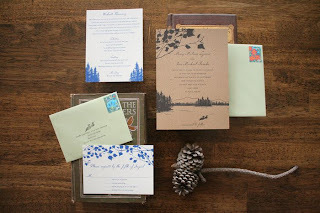 Parrott Design Studio created beautiful stationery, printed on wood grain textured paper and incorporating a loon, the lake and evergreen trees in the colors of the palette, such a pretty collection of stationery and perfect for the location and we loved the wood grain paper the invitations were printed on. Cocktails were enjoyed on the large deck overlooking the camp and the lake, and dinner and dancing were held in the dining hall, with twinkle lights, muslin drapes and wagon wheel chandeliers overhead. 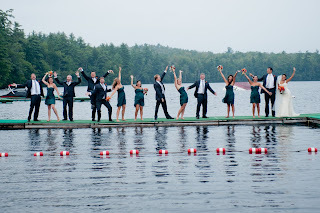 One of the many fun highlights of the day: we took the bridal party out on the floats after the ceremony, just before dusk and walked around on the lake for some fun pictures. 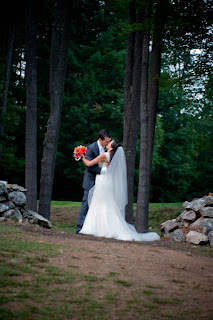 Our best wishes to you Mary and Ian, we loved working with you!